We selected for this the Motorola Dext Android device for our hard reset tutorial since a good portion of our readers still owns it. 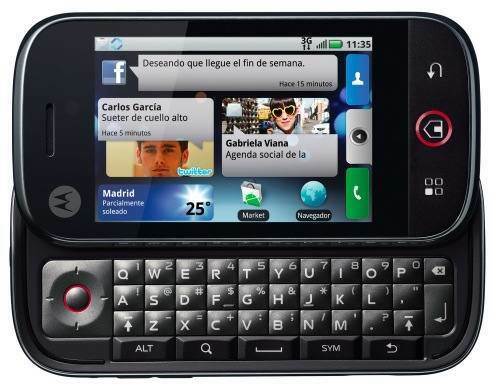 Motorola Dext, also known as Motorola Cliq in USA, is the first device from the company’s own Android operating system and also the first to show the customization layer Motoblur. Due to the personalization for the interface that has passed the Motorola Dext, the method to unlock Android is different to everything we know, however, like previous processes, this will erase all data from the phone, then backup you data before. This process is carried out through a combination of buttons that will give us access to equipment recovery mode, from there we can do, among other things, a factory reset. Turn off your phone and wait five seconds. Turn on the phone and when Motorola logo appears press the camera button for more than 10 seconds, wait for the device to display a menu. When that happens press the volume button less, when you do that you will see a phone and a triangle, now press the Alt key and L together, you will see three options. Among the three options really one that says “Wipe Data / Factory Reset” to select the pad you can go down to it or press Alt and W key. If you did it right the phone will format, now you just need to reboot for the process to complete the hard reset. If you have a MotoBlur account you can recover your files entering your account data in the first system startup. This will leave your phone as the last time you did a backup with this application. As you realize, unlock Android on the Motorola Dext is easy, but if you still have doubts, we will be solving them in the comments.